A new report by the Augusta-based Consumers for Affordable Health Care pans a new state law aimed at lowering health insurance premiums. AUGUSTA, Maine — A Republican-backed state law aimed at lowering health insurance premiums in Maine is being panned in a new report by affordable health care advocates. But supporters of the law, especially those who wrote and co-sponsored it in the Maine Legislature, say the law is working but needs to be fully implemented before anyone draws conclusions about its effectiveness. Supporters say key provisions of the law, including one that allows people to buy health insurance across state lines, have not yet gone into effect. In its report issued earlier this month, Consumers for Affordable Health Care examined health insurance rate renewal information at the Bureau of Insurance. The report focused on renewal rates for insurance customers in the individual and small-group markets. What they found did not bode well for the new law’s effectiveness, said Joe Ditre, executive director of the consumer group. 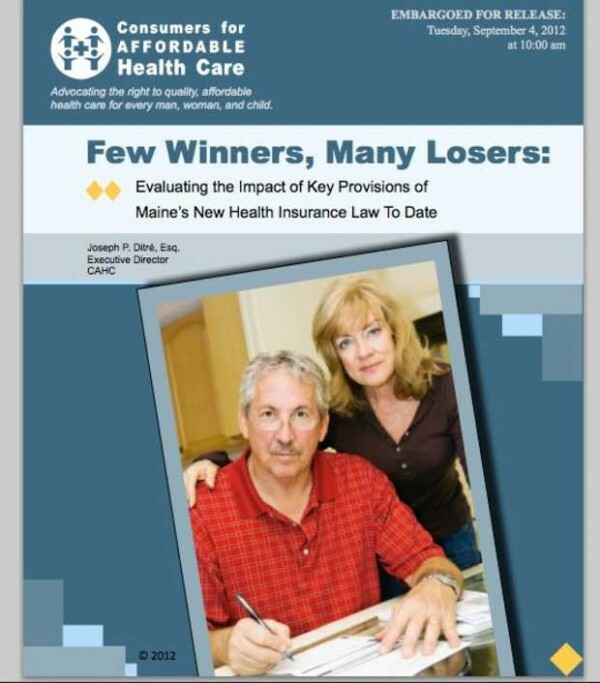 Key findings showed 54 percent of individual policyholders in Maine saw premium increases, while 90 percent of small business policyholders saw rates go up. Small-group plans cover up to 50 employees. The report also draws attention to a new $4 assessment tacked on to all health insurance policies in Maine as a result of the law. That assessment is used to build an annual fund of nearly $21 million that a new nonprofit organization , the Maine Guaranteed Access Reinsurance Association, also created by the law, uses to reinsure the most costly or high-risk clients on the books of Maine insurance companies. But advocates for the law say the new reinsurance pools are the reason Anthem, one of the state’s largest health insurance providers, asked for an average rate increase of only 1.7 percent this year. Without the new nonprofit and the reinsurance pool, the company would have asked for a 21 percent increase, according to officials and documents filed with the bureau. A 21 percent hike for Anthem would not necessarily have been approved by the bureau, according to Doug Dunbar, a spokesman for the Department of Professional and Financial Regulation, which includes the Bureau of Insurance. “It’s not possible to indicate whether a different rate increase request from Anthem would have been approved,” Dunbar wrote in an email. The Maine Guaranteed Access Reinsurance Association board, as defined by the law, is largely controlled by insurance companies doing business in Maine, Ditre said. Of the 11 members of the board, five are insurance company representatives, another is an insurance broker, another is a small-business person — whose small business is in insurance. The other board members include a car sales businessman, two representatives from the medical community and a former credit union president. Advocates for the law say it creates a better “free market” approach to health insurance, but opponents say it’s little more than corporate welfare and an annual $21 million subsidy or bailout for some of the most profitable companies doing business in Maine. The law is written in a way that requires insurance companies to pay the fees collected, but it also allows them not to disclose or itemize the fee. The law also allows the new nonprofit to increase the fee, as needed, by an additional $2 per month, up to $6 per month per person insured. Ditre believes MGARA will almost certainly increase the assessment. He said actuarial studies estimate the true cost of insuring the highest-risk clients in Maine is closer to $65 million, which is three times what MGARA is currently collecting for that purpose. The law changed the way insurance companies are allowed to set rates and allows them to charge more based on location, age and risk assessment. Older people in more rural places are the most vulnerable to the rate increases, and businesses with small-group policies are being hard-hit, Ditre said. Only the small-group policies that include larger numbers of young workers, mostly in southern Maine, have experienced small rate decreases. Supporters of the law say rate increases overall are less than what they’ve been each year prior to the law and that prior to the law there were no notable rate decreases. So the law is moving in the right direction and indeed working, according to one of the co-authors of the bill, state Rep. Les Fossel, R-Alna. Dunbar said the rate data for the fourth quarter of 2011 and the first quarter of 2012 show that 10.6 percent of those in small-group plans across the state saw their rates go down. An analysis by the state’s Bureau of Insurance also touts the reduction in the rate of increase for premiums, but it highlights how rates were still going up for most policyholders post PL 90. Fossel and others have argued that the changes have created a new host of insurance products that allow people to buy the most affordable plan to cover their needs, but Ditre said what’s really happening is people are being left short of the coverage they need. Eric Cioppa, superintendent of the Maine Insurance Bureau, agrees with those who say it will take more time to fully understand the impacts of the new law on insurance rates. He said it’s too soon to tell whether the law is achieving some of its other goals, including drawing more people into the health insurance market in Maine, which could ultimately bring rates down. Cioppa said Consumers for Affordable Health Care’s report failed to mention that insurance providers will pay premiums to MGARA for any clients they want covered in the reinsurance pool. Those premiums are paid at 90 cents on the dollar, he said. He said part of that formulation is that MGARA isn’t in the business to make money but to maximize the $4 assessment to cover claims. Ultimately, that relief is aimed at reducing rates in the individual insurance market, he said. He said the thing that is driving insurance rates skyward in Maine and elsewhere is medical costs. “I’m not casting aspersions on anyone, but the medical costs and the medical trends — I think everyone acknowledges there’s still work to do on that,” Cioppa said.